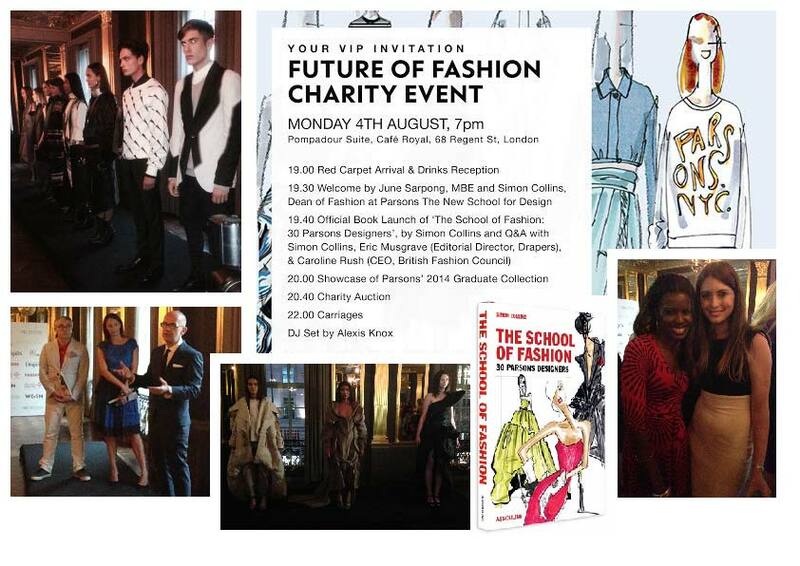 I was lucky enough to get an exclusive invitation to the Future of Fashion charity event in the Café Royal’s Pompadour Suite, in aid of the Prince’s Trust Million Makers scheme. With a warm and bubbly welcome from TV presenter, June Sarpong MBE, (many of you will remember her from mornings spent on the sofa watching T4), the event first saw the book launch of The School of Fashion: 30 Parsons Designers by Simon Collins, the Dean of Fashion at the New School for Design in New York. The beautifully illustrated publication features collaborations in the form of sketches and interviews from some of its most successful alumni including Donna Karan, Alexander Wang, Jason Wu and Proenza Schouler. Caroline Rush, CEO of the British Fashion Council was also in attendance and made sure to remind everyone of the upcoming London Fashion Week next month along with a speech from Eric Musgrave, Editorial Director at Drapers. Highly creative talent was on display from the Parson’s 2014 Graduate Collection where, unafraid to push boundaries, it was clear to see a range of innovative designs from some of the School’s future stars. An auction then commenced with prizes such as a bespoke design by milliner, Alexandra Harper in her studio and front row seats to Busardi’s London Fashion Week show. Singer, Beverley Knight clearly loves those covetable red soled shoes after she outbid others to take home a signed book by Christian Louboutin. Pink champagne and canapés were plentiful to support a thoroughly well organised event highlighting both the creative juices from celebrated designers and emerging talents about to surface.